Toyohara Kunichika (1835-1900) The Actor Onoe Kikugoro V (Onoe Baiko) as the Priest Seishin, from the series One Hundred Roles of Baiko, 1893. Deluxe Oban. This ambitious series, printed on fine paper and using extensive blind embossing and mica powder was commissioned by Fukuda Kumajiro in 1893. 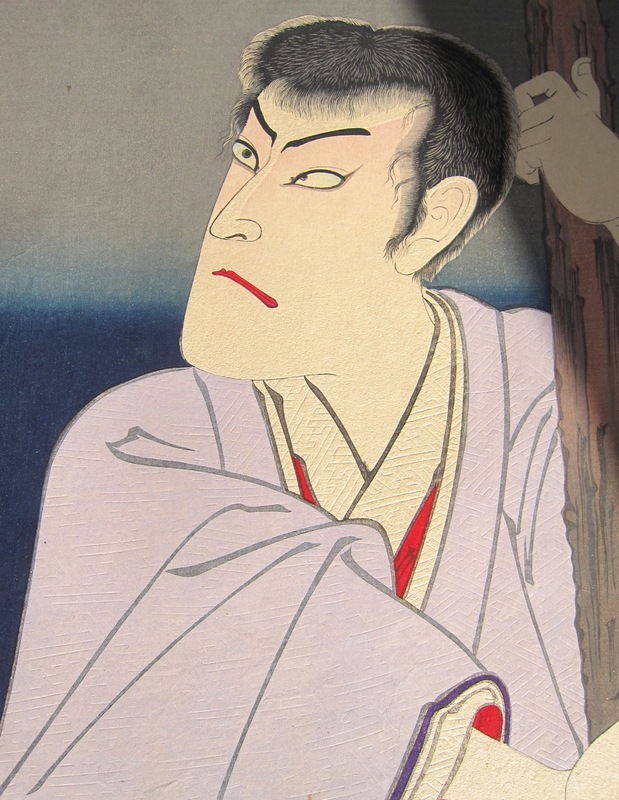 The bulk of each print portrays the actor Onoe Kikugoro V, the upper register shows a different actor in the supporting role. 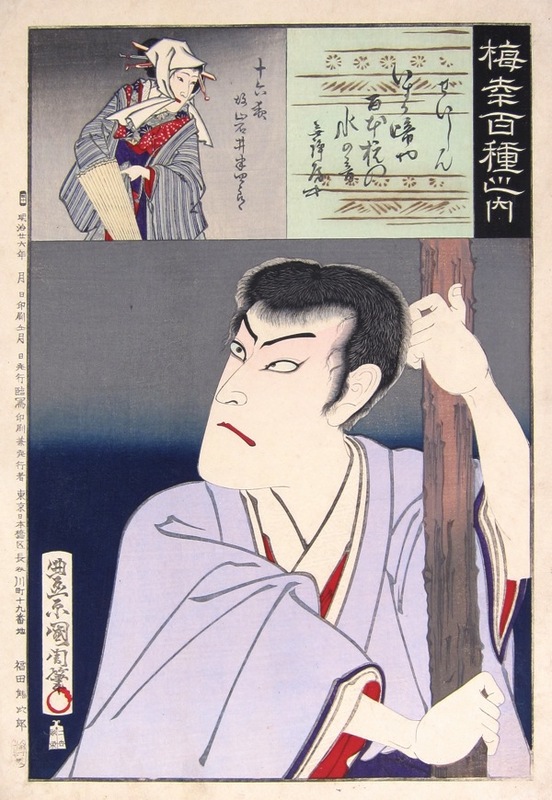 This print shows one of the great kabuki themes of all time and one of the most famous of Japanese villains - the corrupt priest Seishin from the kabuki drama Kosode Soga Azami no Ironui. Seishin is a young priest who seduces the geisha Izayoi. He is banished as punishment and the two lovers agree to commit suicide. Unknown to each other they both survive; Seishin goes on to become a bandit, murdering a young boy for a bag of gold. Izayoi has become a nun but they meet up later in the play and become partners in crime. It turns out that the young boy was Izayoi’s brother and the play concludes with them committing a double suicide in remorse. Kunichika shows Seishin clinging to the staves of a jetty, having failed to drown himself; the cartouche above shows Iwai Hanshiro as Izayoi carrying an umbrella. This series is one of Kunichika’s best portrait series. This print is in exceptionally fine condition. Very clean, unfaded and with little surface damage. The colour and impression are perfect and the the print has many delicate refinements - the mica in the upper cartouche, the deep embossing on the robes of Seishin, the mica laden robes representing the dripping water. The prints from this series, when they are in mint condition as these are, are truly remarkable examples of the refinement of woodblock printing in the Meiji at its peak.